Buses depart every 10-20 minutes from April to October and weekends from November to March, every 30 minutes Monday to Friday from November to March. Grand Line: operates from 9.40 to 16.00 from April to October, and from 10.00 to 15.00 from November to March. Express Line: operates from 9.40 to 18.00 between April and October, and from 10.0 to 16.30 from November to March. Hop-On Hop-Off buses operate all year. We are comparing Munich City Sightseeing Bus Tour Prices from leading ticket suppliers and Try to find you Cheap tickets prices on the market. Welcome to Munich and welcome to its famous big red open top city sightseeing bus. With a 1 or 2 day pass this iconic mode of transport you'll be able to explore the city of Munich at your own pace and visit all the attractions on your personalised list. With a choice of 3 separate lines and over 13 stops across the city, each of which is located within a short walk of at least one of Munich's top attractions, so there's sure to be something to please every visitor. The best part is that the pass is so easy to use, simply pick up your ticket from a Hop-On Hop-Off stop and scan it each time you board the bus. No confusing ticket machines and no messing about with change. Onboard have to option to learn about the Bavarian Capital from a multilingual audio guide, check out the nearby sights and attraction with free onboard Wi-Fi, or, sit back and enjoy panoramic views as you cruise through the city of Munich. Hop-On Hop-off buses are ideal for independent travellers who prefer to see the city without an organised tour or tour guide. The 1 and 2-day tickets are excellent value for visitors travelling on a budget. Perfect for families with young children, disabled visitors, or individuals to travel the city with ease. 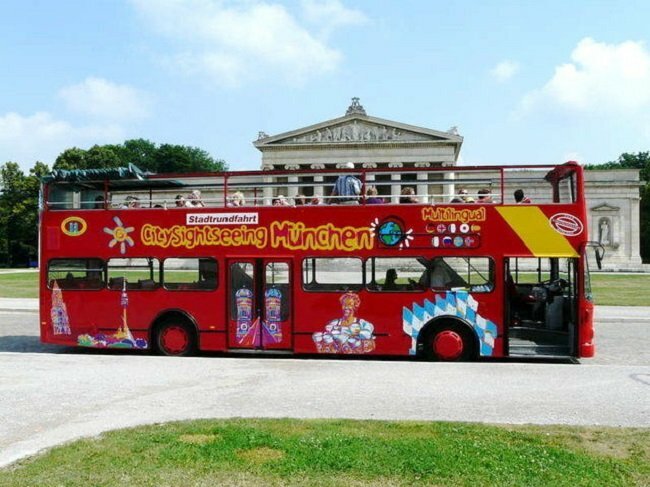 Your Experience With Munich City Sightseeing Bus Tour? Travel the city in style on the iconic open top double decker sightseeing bus. Enjoy a flexible city sightseeing tour which lets you choose your own itinerary. Hop-On or Hop-off at any of the marked stops across the city of Munich. Hear the history and stories of Munich from a free onboard audio guide. What Munich City Sightseeing Bus Tour Includes? Unlimited access to all Hop-On Hop-Off sightseeing buses for 1 or 2 days (depending which is selected. Onboard headphones and audio guide in: English, German, French, Spanish, Italian, Portuguese, Japanese, Chinese, Russian, Norwegian, Danish, and Swedish. Grand Line: Central Station – Pinakothenken – Odeon Square – Ice Wave – Marien Square – Max Joseph Square – Karl Square – Nymphenburg Palace – BMW World – Olympic Park/Aquarium/shuttle stop for Allianz Arena – English Garden. Circle Line Central Station - Pinakotheken – Hofbrauhaus – National Theatre – Marien Square. Shuttle: Nymphenburg Palace – Olympic Park – Allianz Arena. (April to October). Unbiased comparison of Munich's Best Hop-on Hop-off Sightseeing Tours operators(Grand Hop-On Hop-Off Double-Decker Gray Line vs Munich Sightseeing Bus Tours) based extensive research, Tripindicator team came up with comprehensive recommendations about Munich sightseeing tours which helps you choosing Best Munich Hop-on Hop-off Sightseeing Tour suitable for your travel. Some museums will be closed on Sundays so plan your activities with this in mind. Travelers Reviews about Munich City Sightseeing Bus Tour? Hop-On Hop-Off city sightseeing buses are very popular across most of Central Europe, Munich Hop-On Hop-Off bus tours have an overall rating of 4 out of 5 on TripAdvisor which is reputable travel sight. Travellers say that the 1 or 2-day pass is good for orientating yourself in the city and for getting to a lot of attractions. Negative comment have referred to buses turning up late, however, this seems to be rare. Printed or mobile vouchers are accepted. Exchange your voucher for your 1 or 2-day pass at any of the marked Hop-On Hop-Off bus stops. Cancellation policy will depend on which supplier your ticket was purchased from. Get Your Guide will issue full refunds up to 24 hours in advance and Viator will issue full refunds up to 7 days in advance with partial of full ticket price reduced if the cancellation is made less than 7 days in advance. The Grand Circle bus line is only available in German or English. From April to October the Grand Circle will include a shuttle to the Allianz Arena. Each circuit takes approximately 1 hour. The starting point for each tour is outside Munich Central Station but you can hop on at any stop across the city. Join any Hop-On Hop-Off sightseeing bus at any of the marked city stops.